The significance of a toll free number in a business is known to everybody and this becomes evident from the increasing demand of these numbers. The popular toll free prefixes: 800, 888, 877, and 866 were exhausted and FCC was compelled to release the 855 prefix. But in no time these were also mostly used upped. Last December, the FCC released a new batch of toll free numbers with the 844 toll free prefix. A toll free vanity number has all the features of a standard toll free number. It can be used across the US and Canada. It never charges the caller for a call. Research has shown that businesses with a toll free number attract more attention than one without, though both offer the same services. Additionally, a vanity number has one extra advantage. 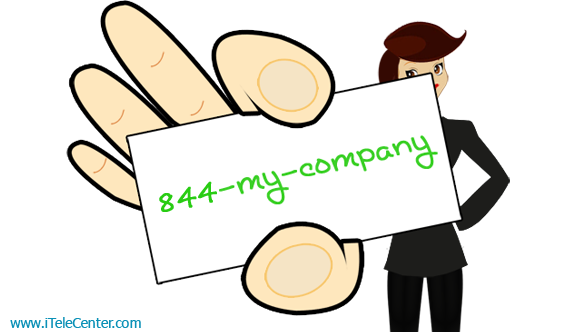 It makes a phone number easily memorable, by spelling out the name of a brand, a company, a product or a service. Thus vanity numbers connect businesses with their customers and prospects thereby strengthening business relationships. Vanity numbers are easily memorable. A phone number, even a toll free number, is nothing more than a string of 10 random digits. But a vanity number contains a brand name, or the name of a product or service. This not only makes a phone number memorable but also acts in the branding of a business. When people remember your phone number and can also identify your brand, it is quite likely that they will call you, whenever they need the kind of products or services that you provide. These numbers make a business look smart and professional. It also provides a kind of assurance to your customers that you are available 24×7 at their service. While making a purchase people often look for after-sales service. This is a time when this type of number becomes extremely useful. A vanity number gives your customers the assurance of your service, credibility and sincerity. If you still haven’t got an 844 vanity number for your business, get one now and share your experience with us on Facebook and @Twitter.